A Technical Business Analyst works hand-in-hand and assists the business in process improvement. This professional is saddled with the following roles and responsibilities – performing research and interviews for determining the IT requirements and translating them into specifications, assisting the management in change management, helping the business in meeting schedules, budget objectives; providing leadership assistance to other analysts for planning, analyzing and executing plans, liaising between the technical and business team to render support in the development of business requirements and documenting customer requirements. As a Technical Business Analyst, candidates should have the ability to work on any type of software and show proficiency in MS Office, SQL queries, software design tools, Visio, Gap analysis, risk assessment, and technology integration. 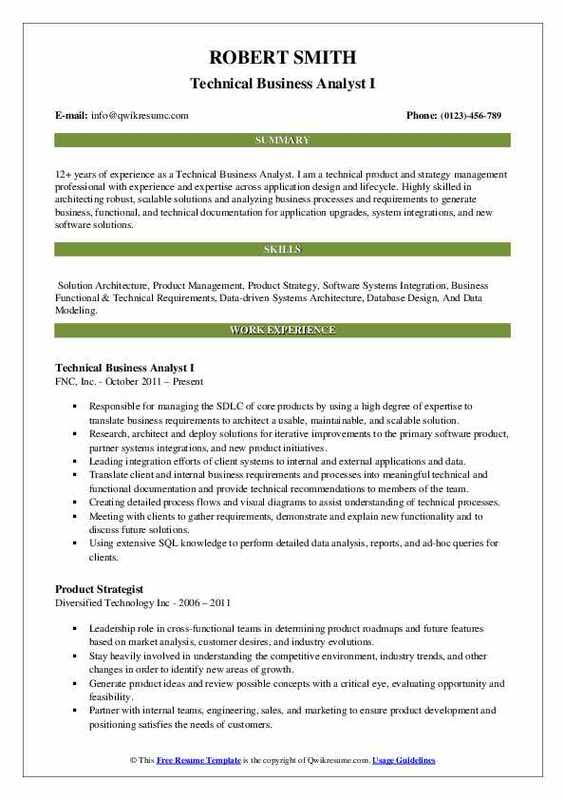 Eligible Technical Business Analyst Resume displays a college degree with a mix of IT and business that may include IS, financial management or Computer science. 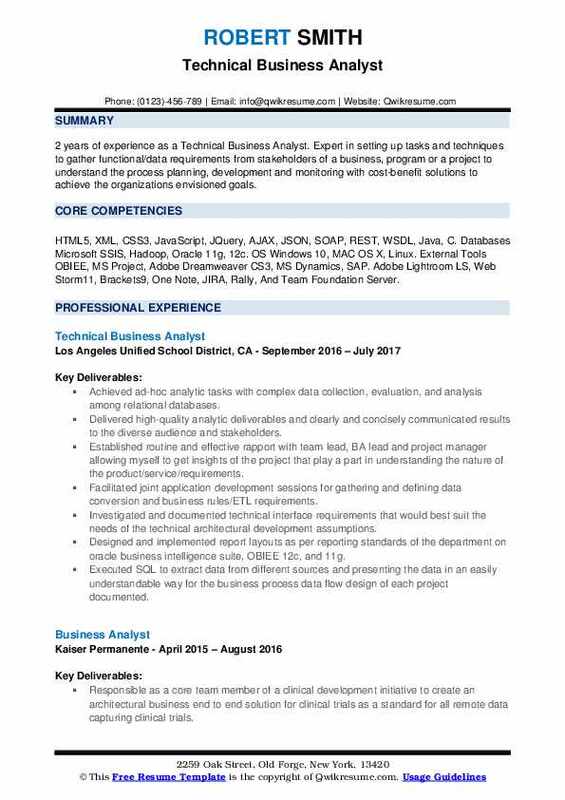 Objective : Over 3 years of experience as a Technical Business Analyst in diverse sectors such as the Health Care, Education, Financial services. Strong knowledge on the Provider Business Services in Health Care Industry Strong Knowledge on complete System Development Life Cycle (SDLC) process including Data Analysis, System Analysis, Design, Development, Testing, Implementation, and Documentation. 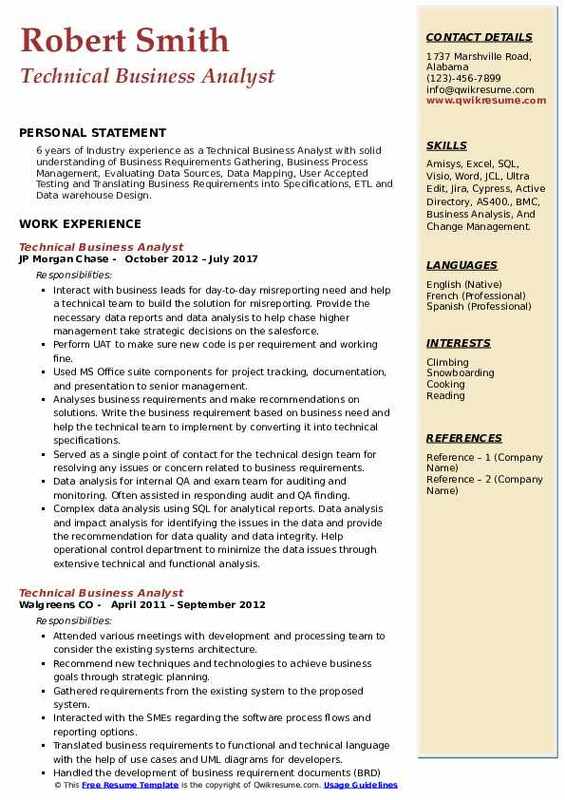 Skills : Gap Analysis, Microsoft SharePoint, Rational, SAS, Serial Attached SCSI, Rational Tools (Requisite Pro, Rational Quality Manager, Clear Quest, Rational Team Concert), HP Service Manager, IBM Cognos Connection Reporting Tool, Geo Access Directory Expert Software, MS Office Suite, MS Visio, MS Access, SharePoint, And Clarity Time Reporting Tool. Actively involved in various projects such as the customer identification process for a health savings account, claims recycle project, member offsets project. Elicit business and technical requirements from the spending account vendor acclaim. Act as business and technical liaison for Acclaris and Highmark member portal. Involved in creating user stories, use cases, and acceptance criteria and testing the product. Understanding various domain dependencies and actively involved in communicating the impacts of the project delivery process. Advise the agile transformation of the spending account platform as the scrum master. Extensive knowledge of keying claims, creating test cases, test scripts, regression testing, web service testing. Strong knowledge in utilizing tools such as the req pro, rational team concert, rational quality manager, clear quest. Recommend strategic solutions to stakeholders based on project scope and budget. Collaborate with the cross-functional scrum team to ensure the successful implementation of business requirements. Perform gap analysis of user flows for the current system and proposed system redesign. Experienced in various internal systems such as the spending account application ICIS, ECS, member portal, oscar claim web application. 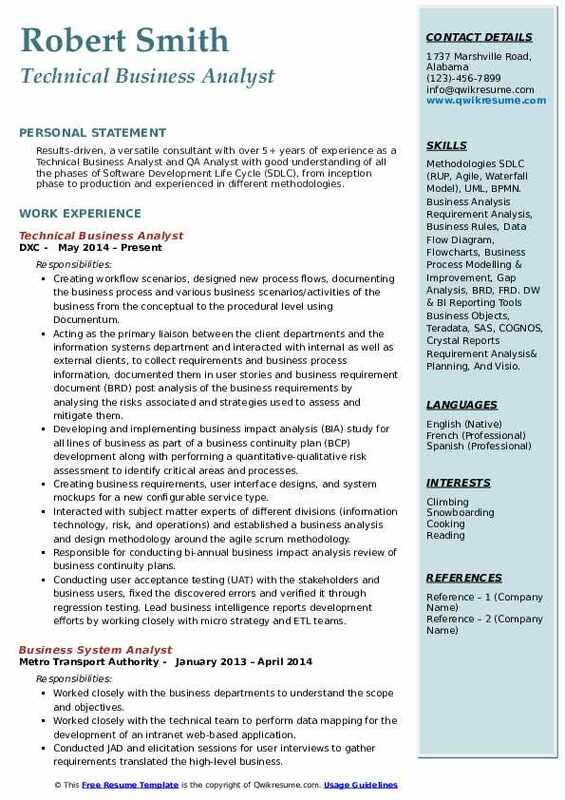 Objective : 2 years of experience as a Technical Business Analyst. Expert in setting up tasks and techniques to gather functional/data requirements from stakeholders of a business, program or a project to understand the process planning, development and monitoring with cost-benefit solutions to achieve the organizations envisioned goals. Achieved ad-hoc analytic tasks with complex data collection, evaluation, and analysis among relational databases. Delivered high-quality analytic deliverables and clearly and concisely communicated results to the diverse audience and stakeholders. Established routine and effective rapport with team lead, BA lead and project manager allowing myself to get insights of the project that play a part in understanding the nature of the product/service/requirements. Facilitated joint application development sessions for gathering and defining data conversion and business rules/ETL requirements. Investigated and documented technical interface requirements that would best suit the needs of the technical architectural development assumptions. Designed and implemented report layouts as per reporting standards of the department on oracle business intelligence suite, OBIEE 12c, and 11g. Executed SQL to extract data from different sources and presenting the data in an easily understandable way for the business process data flow design of each project documented. Defined and documented queries for generating drill down and drill through reports in SSRS. Documented ETL metadata reports using SSRS, reports include like execution times for the SSIS packages, failure reports with the error description. Wrote data analysis relevant queries in SQL server RDBMS dataset development including T-SQL programming. Documented all data mapping and transformation processes in the functional design documents based on the business requirements on ms project and MS Excel. 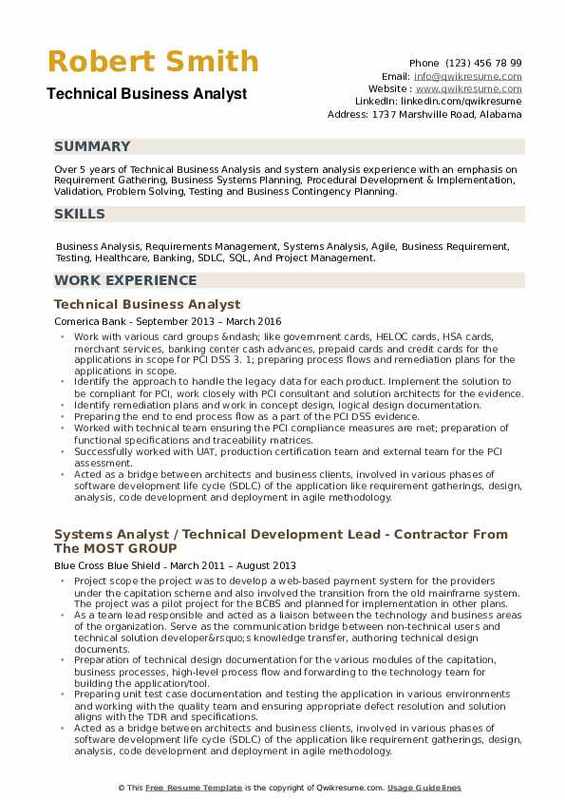 Summary : 12+ years of experience as a Technical Business Analyst. I am a technical product and strategy management professional with experience and expertise across application design and lifecycle. Highly skilled in architecting robust, scalable solutions and analyzing business processes and requirements to generate business, functional, and technical documentation for application upgrades, system integrations, and new software solutions. Skills : Solution Architecture, Product Management, Product Strategy, Software Systems Integration, Business Functional & Technical Requirements, Data-driven Systems Architecture, Database Design, And Data Modeling. Responsible for managing the SDLC of core products by using a high degree of expertise to translate business requirements to architect a usable, maintainable, and scalable solution. Research, architect and deploy solutions for iterative improvements to the primary software product, partner systems integrations, and new product initiatives. Leading integration efforts of client systems to internal and external applications and data. Translate client and internal business requirements and processes into meaningful technical and functional documentation and provide technical recommendations to members of the team. Creating detailed process flows and visual diagrams to assist understanding of technical processes. Meeting with clients to gather requirements, demonstrate and explain new functionality and to discuss future solutions. Using extensive SQL knowledge to perform detailed data analysis, reports, and ad-hoc queries for clients. Developing and maintaining database-level user functions, stored procedures, triggers, and jobs. Providing production and staging environment technical support to clients to resolve issues, provide guidance, and validate new development to ensure proper functionality. Assisting quality assurance technicians in creating test plans for accurate validation there. Using the team foundation server in an agile scrum setting to create and manage product backlog items, the track builds, and monitor the overall progress of each sprint. Leading analyst in the creation and deployment of a completely new version of a collateral evaluation delivery portal that integrates with all client systems and downstream external systems. Objective : Over 3 years of experience as a Business Analyst and Technical Writer Excellent analytical skills to understand the business process, functionality, requirements and to translate them into Requirement Specifications. Skills : Agile, RUP And Structured Design Method (Waterfall Method) Business Modeling MS Visio, Rational Suite, MS-Project Requirement Management Rational Requisite Pro Databases MS-Access, SQL-Server, Oracle 9i/8i Office Tools MS-Office (Word, Excel, PowerPoint, Pivot Tables) Testing Tools Quick Test Professional 8.2/9.0, Win Runner 7.6/8.0, Load Runner 7.6/8.0, Test Director, Quality Center, Team Track, Visual Intercept, And Selenium. Participating in JAD sessions with subject matter experts (SME) to gather requirements and document them. Assisting in creating the product backlog by working closely with the business owner. Developing business modeling, iterative progress using agile-scrum approach. Working collaboratively with various teams and product managers on-site and off-site at different stages of the project to document the user stories and acceptance criteria. Facilitating meetings for the sign off the user stories and acceptance criteria by the senior management. Document requirements, create functional specifications and prepare wireframes/flowcharts. Monitoring performance, discover variances and propose necessary actions. Validating the functionality of the end product according to the required specifications. Experience in a gap analysis of the as-is and to-be processes to identify and validate the requirements. Experience in documenting the data elements grid matrix and requirements traceability matrix. Providing support for oracle SMEs users and constantly improving the user experience. Summary : Results-driven, a versatile consultant with over 5+ years of experience as a Technical Business Analyst and QA Analyst with good understanding of all the phases of Software Development Life Cycle (SDLC), from inception phase to production and experienced in different methodologies. Skills : Methodologies SDLC (RUP, Agile, Waterfall Model), UML, BPMN. Business Analysis Requirement Analysis, Business Rules, Data Flow Diagram, Flowcharts, Business Process Modelling & Improvement, Gap Analysis, BRD, FRD. DW & BI Reporting Tools Business Objects, Teradata, SAS, COGNOS, Crystal Reports Requirement Analysis& Planning, And Visio. Creating workflow scenarios, designed new process flows, documenting the business process and various business scenarios/activities of the business from the conceptual to the procedural level using Documentum. Acting as the primary liaison between the client departments and the information systems department and interacted with internal as well as external clients, to collect requirements and business process information, documented them in user stories and business requirement document (BRD) post analysis of the business requirements by analysing the risks associated and strategies used to assess and mitigate them. Developing and implementing business impact analysis (BIA) study for all lines of business as part of a business continuity plan (BCP) development along with performing a quantitative-qualitative risk assessment to identify critical areas and processes. Creating business requirements, user interface designs, and system mockups for a new configurable service type. Interacted with subject matter experts of different divisions (information technology, risk, and operations) and established a business analysis and design methodology around the agile scrum methodology. Responsible for conducting bi-annual business impact analysis review of business continuity plans. Conducting user acceptance testing (UAT) with the stakeholders and business users, fixed the discovered errors and verified it through regression testing. Lead business intelligence reports development efforts by working closely with micro strategy and ETL teams. Created out of the box user stories to document the new product functionality. Documented requirements for new system customizations, prepared workflow diagrams UI screen mock-ups, and technical design documents. Worked with agile scrum team, writing user stories, sprint planning pre-planning, conducting daily scrum meetings. Responsible for the business requirements, ETL analysis, ETL test and design of the flow and the logic for the data warehouse project. Continuous coordination with development teams for defect resolution and tracking defects to closure. Headline : Information Technology professional with 3 years of extensive experience as a Technical Business Analyst in designing and executing cost-effective, high-performance technology solutions serving the telecommunications industry. Skills : Agile Methodology, Visual Basic, SQL Business: SDLC, MS Project, SQL, Advance MS Excel, MS Access, SAP Business One Statistical And Reporting Tools: Minitab, SAS, SSRS Reports, Tableau, KPI And Dashboards, Data Mart, And Data Warehousing. Assisting in the assessment of business processes and related project goals. Delivery of comprehensive project estimations/timelines in the leadership role. Conducting business requirements, functional and technical meetings with business groups. Preparing business requirement documents (BRD) including gap analysis with client requirements and existing new business system. Managing functional specifications documents and handled changes required for the system. Participating in testing activities. Development of test cases as a basis for performing integration and system testing for functional testing by following phases of test life cycle. Translating and documenting the business needs of the clients into business requirements which are clear, accurate, and concise. Making sure to create a requirements traceability using the corporate standard templates which would be leveraged by all impacted downstream applications. 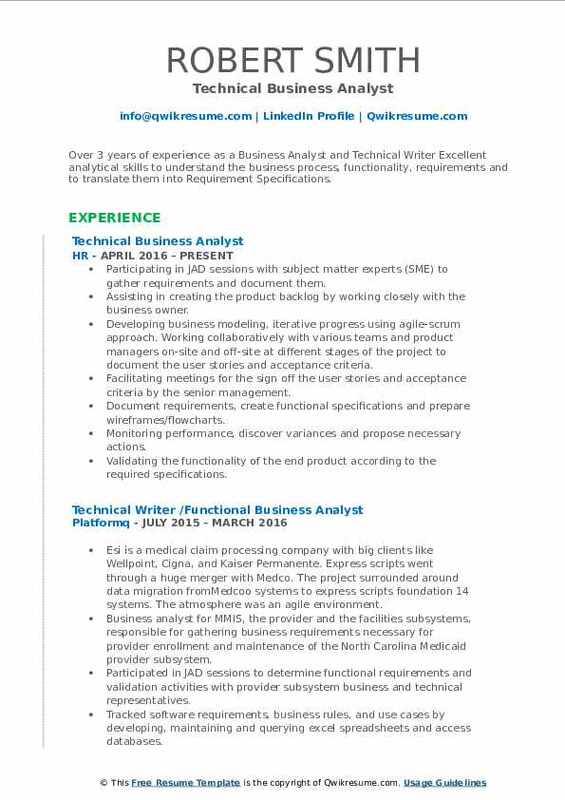 Objective : IT Professional with 3+ years of experience in Technical Business Analysis and Agile (Scrum) Methodology. In-depth knowledge of Software Development Life Cycle (SDLC), having a thorough understanding of various phases like requirements, analysis/design, and development and testing. Skills : Business Analysis Data Warehouse And ETL Agile (Scrum) Methodology, Data Analysis IM/PM/Change Process Software Development Life Cycle Test Cases/Plans Preparation Scrum Process Technical Methodologies SDLC, STLC, Waterfall, Agile - SCRUM, SWOT Analysis, And GAP Analysis. Interacted with the stakeholders to understand the current state of a system and define future needs based on analysis of business requirements after implementing gap analysis. Conducted JAD sessions for requirement elicitation and to allow stakeholders to communicate their perspectives. Part of the current state analysis and identified the business/technical gaps. Part of future state requirement analysis and documented the business/technical requirements in the confluence pages. Facilitated MW design sessions with MCD architecture and IT development team to define an SDK MW design to meet enterprise, business, and data processing requirements. Prepared er diagram, use cases, and data flow diagrams to communicate the page flow and user interaction with the system. Worked closely with architects and converted the technical requirements into user stories accordingly. Provided business functional assistance and support to project managers, offshore lead, and client. 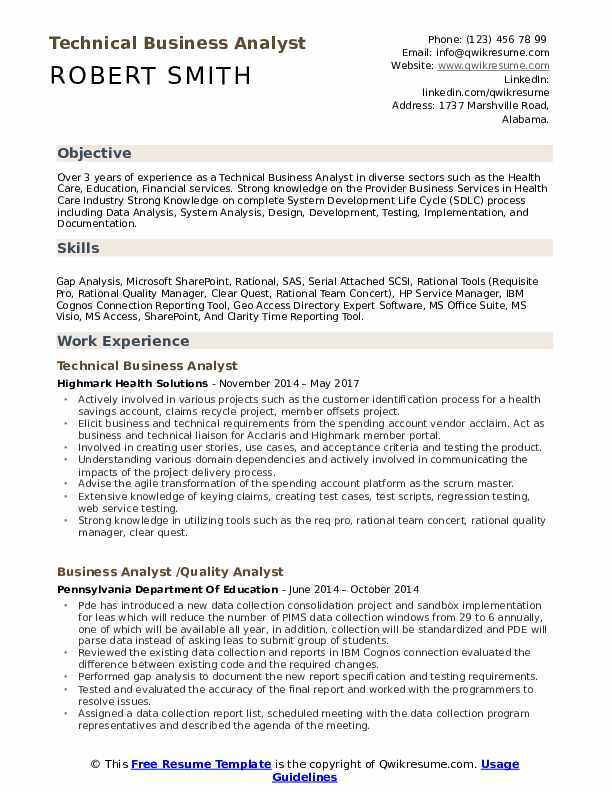 Headline : Technical Business Analyst with over 5 years industry experience in business data modeling, software requirement analysis, process modeling, process flow and quality assurance skills using different methodologies, mainly OOA, OOAD and UML Strong knowledge of Healthcare, Energy, and Retail with emphasis on Business Requirements and Functional Requirements. 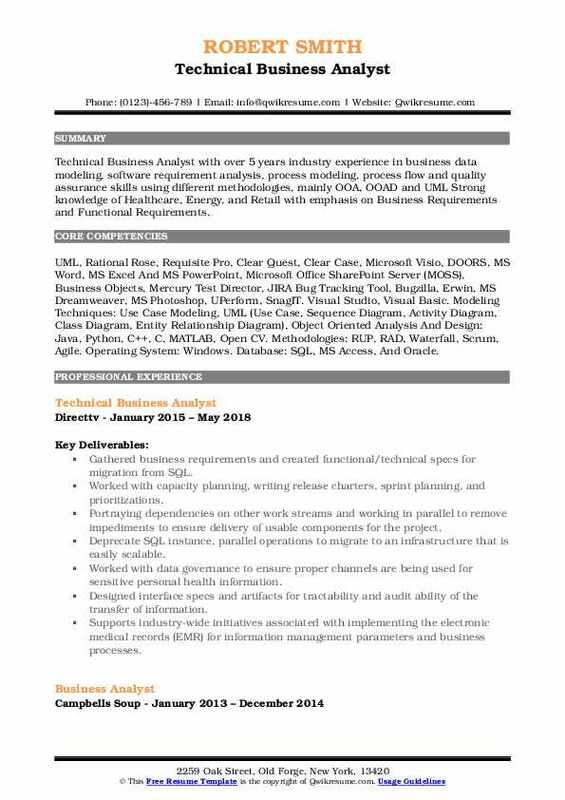 Skills : UML, Rational Rose, Requisite Pro, Clear Quest, Clear Case, Microsoft Visio, DOORS, MS Word, MS Excel And MS PowerPoint, Microsoft Office SharePoint Server (MOSS), Business Objects, Mercury Test Director, JIRA Bug Tracking Tool, Bugzilla, Erwin, MS Dreamweaver, MS Photoshop, UPerform, SnagIT. Visual Studio, Visual Basic. Modeling Techniques: Use Case Modeling, UML (Use Case, Sequence Diagram, Activity Diagram, Class Diagram, Entity Relationship Diagram), Object Oriented Analysis And Design: Java, Python, C++, C, MATLAB, Open CV. Methodologies: RUP, RAD, Waterfall, Scrum, Agile. Operating System: Windows. Database: SQL, MS Access, And Oracle. Gathered business requirements and created functional/technical specs for migration from SQL. Worked with capacity planning, writing release charters, sprint planning, and prioritizations. Portraying dependencies on other work streams and working in parallel to remove impediments to ensure delivery of usable components for the project. Deprecate SQL instance, parallel operations to migrate to an infrastructure that is easily scalable. Worked with data governance to ensure proper channels are being used for sensitive personal health information. Designed interface specs and artifacts for tractability and audit ability of the transfer of information. Supports industry-wide initiatives associated with implementing the electronic medical records (EMR) for information management parameters and business processes. Used knowledge of healthcare information systems to develop the proposed workflow in MS Visio. Data mapping, logical data modeling, created class diagrams and ER diagrams. 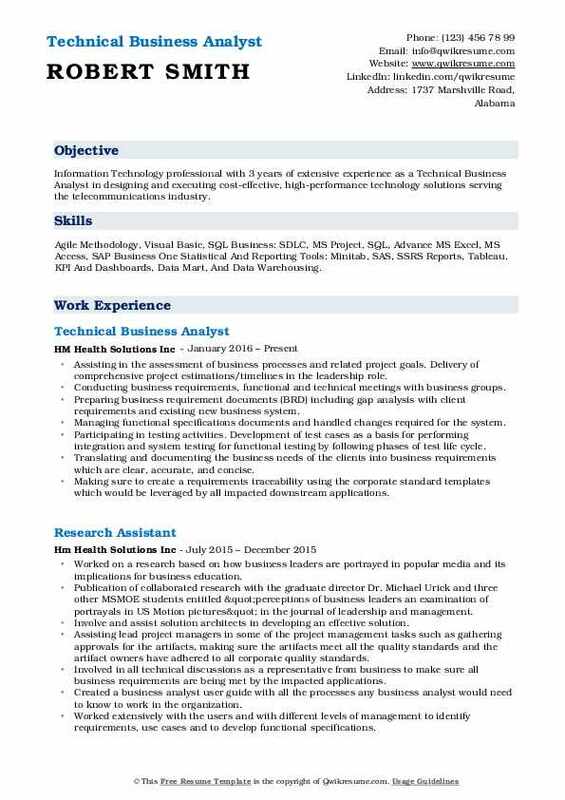 Headline : 6 years of Industry experience as a Technical Business Analyst with solid understanding of Business Requirements Gathering, Business Process Management, Evaluating Data Sources, Data Mapping, User Accepted Testing and Translating Business Requirements into Specifications, ETL and Data warehouse Design. Skills : Amisys, Excel, SQL, Visio, Word, JCL, Ultra Edit, Jira, Cypress, Active Directory, AS400., BMC, Business Analysis, And Change Management. Interact with business leads for day-to-day misreporting need and help a technical team to build the solution for misreporting. Provide the necessary data reports and data analysis to help chase higher management take strategic decisions on the salesforce. Perform UAT to make sure new code is per requirement and working fine. Used MS Office suite components for project tracking, documentation, and presentation to senior management. Analyses business requirements and make recommendations on solutions. Write the business requirement based on business need and help the technical team to implement by converting it into technical specifications. Served as a single point of contact for the technical design team for resolving any issues or concern related to business requirements. Data analysis for internal QA and exam team for auditing and monitoring. Often assisted in responding audit and QA finding. Complex data analysis using SQL for analytical reports. Data analysis and impact analysis for identifying the issues in the data and provide the recommendation for data quality and data integrity. Help operational control department to minimize the data issues through extensive technical and functional analysis. Automating the reports and process. I have taken initiative on this and created purely automated misreports based on ms excel. Different initiative to enhance project process by creating Sharepoint site to create change control to tighten the code movement and government auditing and avoid the data integrity issues. Coordinate with operation production team and help them with day-to-day data issues and resolutions. 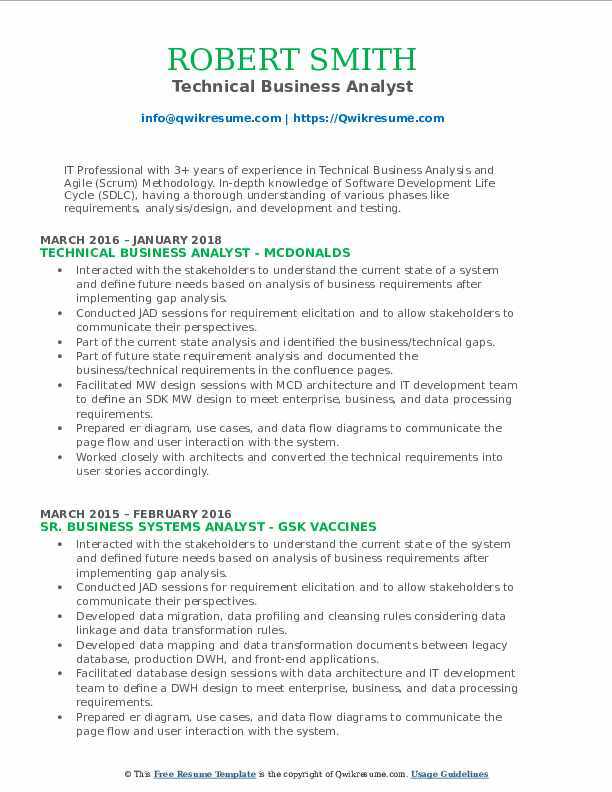 Objective : Over 5 years of Technical Business Analysis and system analysis experience with an emphasis on Requirement Gathering, Business Systems Planning, Procedural Development & Implementation, Validation, Problem Solving, Testing and Business Contingency Planning. Skills : Business Analysis, Requirements Management, Systems Analysis, Agile, Business Requirement, Testing, Healthcare, Banking, SDLC, SQL, And Project Management. Work with various card groups – like government cards, HELOC cards, HSA cards, merchant services, banking center cash advances, prepaid cards and credit cards for the applications in scope for PCI DSS 3. 1; preparing process flows and remediation plans for the applications in scope. Identify the approach to handle the legacy data for each product. Implement the solution to be compliant for PCI, work closely with PCI consultant and solution architects for the evidence. Identify remediation plans and work in concept design, logical design documentation. Preparing the end to end process flow as a part of the PCI DSS evidence. Worked with technical team ensuring the PCI compliance measures are met; preparation of functional specifications and traceability matrices. Successfully worked with UAT, production certification team and external team for the PCI assessment. Acted as a bridge between architects and business clients, involved in various phases of software development life cycle (SDLC) of the application like requirement gatherings, design, analysis, code development and deployment in agile methodology.